It's Far, It's Small, It's Cool: It's an Icy Exoplanet! Using a network of telescopes scattered across the globe, including the Danish 1.54m telescope at ESO La Silla (Chile), astronomers  discovered a new extrasolar planet significantly more Earth-like than any other planet found so far. The planet, which is only about 5 times as massive as the Earth, circles its parent star in about 10 years. It is the least massive exoplanet around an ordinary star detected so far and also the coolest . The planet most certainly has a rocky/icy surface. Its discovery marks a groundbreaking result in the search for planets that support life. The new planet, designated by the unglamorous identifier of OGLE-2005-BLG-390Lb, orbits a red star five times less massive than the Sun and located at a distance of about 20,000 light years, not far from the centre of our Milky Way galaxy. Its relatively cool parent star and large orbit implies that the likely surface temperature of the planet is 220 degrees Centigrade below zero, too cold for liquid water. It is likely to have a thin atmosphere, like the Earth, but its rocky surface is probably deeply buried beneath frozen oceans. It may therefore more closely resemble a more massive version of Pluto, rather than the rocky inner planets like Earth and Venus. "This planet is actually the first and only planet that has been discovered so far that is in agreement with the theories for how our Solar System formed ", said Uffe Gråe Jørgensen (Niels Bohr Institute, Copenhagen, Denmark), member of the team. The favoured theoretical explanation for the formation of planetary systems proposes that solid 'planetesimals' accumulate to build up planetary cores, which then accrete nebular gas - to form giant planets - if they are sufficiently massive. Around red dwarfs, the most common stars of our Galaxy, this model favours the formation of Earth- to Neptune-mass planets being between 1 and 10 times the Earth-Sun distance away from their host. 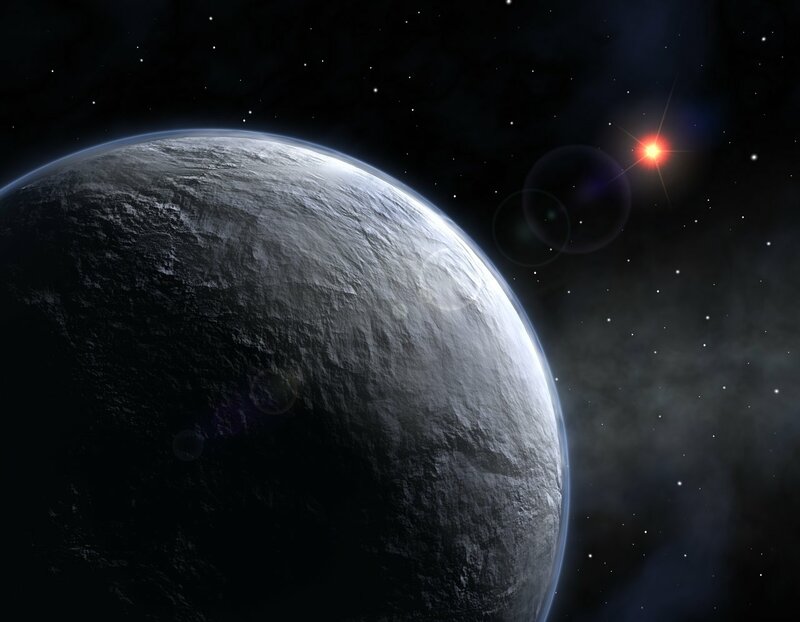 "OGLE-2005-BLG-390Lb is only the third extra-solar planet discovered so far through microlensing searches ", said Jean-Philippe Beaulieu (Institut d'Astrophysique de Paris, France), the lead author. "While the other two microlensing planets have masses of a few times that of Jupiter, the discovery of a 5 Earth mass planet - though much harder to detect than more massive ones - is a strong hint that these lower-mass objects are very common. " Contrary to most exoplanets discovered, OGLE-2005-BLG-390Lb was indeed found using the 'microlensing' technique, based on an effect noted by Albert Einstein in 1912. "With this method, we let the gravity of a dim, intervening star act as a giant natural telescope for us, magnifying a more distant star, which then temporarily looks brighter ", explained team member Andrew Williams (Perth Observatory, Australia). "A small 'defect' in the brightening reveals the existence of a planet around the lens star. We don't see the planet, or even the star that it's orbiting, we just see the effect of their gravity. " Such an intervening star causes a characteristic brightening that lasts about a month. Any planets orbiting this star can produce an additional signal, lasting days for giant planets down to hours for Earth-mass planets. In order to be able to catch and characterize these planets, nearly-continuous round-the-clock high-precision monitoring of ongoing microlensing events is required. This is achieved by the PLANET network of 1m-class telescopes consisting of the ESO 1.54m Danish at La Silla (Chile), the Canopus Observatory 1.0m (Hobart, Tasmania, Australia), the Perth 0.6m (Bickley, Western Australia), the Boyden 1.5m (South Africa), and the SAAO 1.0m (Sutherland, South Africa). Since 2005, PLANET operates a common campaign with RoboNet, a UK operated network of 2m fully robotic telescopes currently comprising the Liverpool Telescope (Roque de Los Muchachos, La Palma, Spain) and the Faulkes Telescope North (Haleakala, Hawaii, USA). The OGLE (Optical Gravitational Lensing Experiment) search team (led by A. Udalski, Warsaw University Observatory, Poland) discovered the event OGLE-2005-BLG-390 on 11 July 2005, triggering the PLANET telescopes to start taking data. 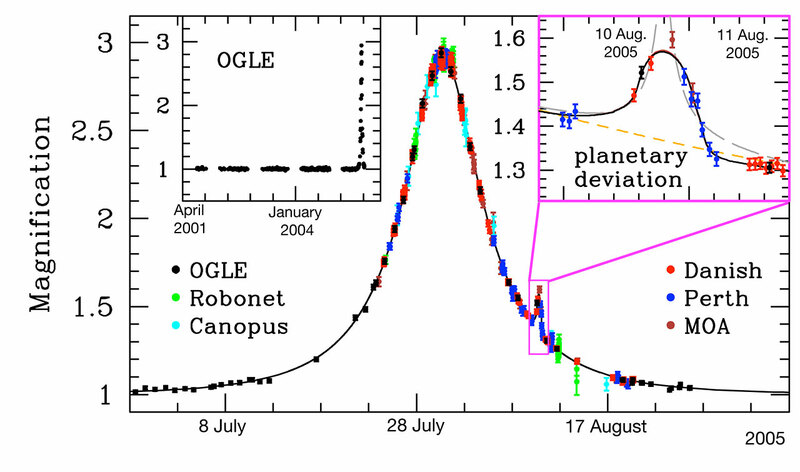 A light curve consistent with a single lens star peaking at an amplification of about 3 on 31 July 2005 was observed, until 10 August when PLANET member Pascal Fouqué, observing at the Danish 1.54m at ESO La Silla, noticed a planetary deviation. An OGLE point from the same night showed the same trend, while the last half of the planetary deviation, lasting about a day, had been covered by images from Perth Observatory. The MOA (Microlensing Observations in Astrophysics) collaboration was later able to identify the source star on its images and confirmed the deviation. No other interpretation than the presented sub-Neptune mass planet with its quoted parameters appeared to fit the extensive data set. This discovery brings a fresh look at the field of planetary science. In particular, astronomers now think that such frozen worlds are much more common than their larger, Jupiter-like brethren. "Indeed if Jupiter-like planets were as widespread, the microlensing method should have found dozens of them by now ", said David Bennett (University of Notre Dame, USA), another PLANET team member. The microlensing technique is most probably the only method currently capable of detecting planets similar to Earth. "The search for a second Earth is the driving force behind our research and this discovery constitutes a major leap forward since it is the most Earth-like planet we know of so far ", said co-author Daniel Kubas, from ESO. A report has been published in the 26 January 2006 edition of the leading journal Nature ("Discovery of a cool planet of 5.5 Earth masses through gravitational microlensing" by J.-P. Beaulieu, D. P. Bennett, P. Fouqué, A. Williams, M. Dominik, U. G. Jørgensen, D. Kubas et al.). High resolution images and their captions are available on this page. This press release is also accompanied by Broadcast quality material. This result is a joint effort of three independent microlensing campaigns: PLANET/RoboNet, OGLE, and MOA, involving a total of 73 collaborators affiliated with 32 institutions in 12 countries (France, United Kingdom, Poland, Denmark, Germany, Austria, Chile, Australia, New Zealand, United States of America, South Africa, and Japan). This value is uncertain by a factor of two. The lowest-mass exoplanet known until now was GJ 876d, which has a probable mass of 7.5 Earth's masses. Unlike the present discovered planet, GJ 876d circles its parent star in about 2 days. It is thus very hot. By comparison, Uranus has about 15 times the mass of the Earth and Neptune, 17, while giant Jupiter weighs as much as 318 earths.